We looked at the top 1 Packing Cubes and dug through the reviews from 7 of the most popular review sites including BestReviews, Best Products, Wanderlust Storytellers, Savored Journeys, Travel Gear Zone, Land Of The Traveler and more. Through this analysis, we've determined the best Packing Cube you should buy. These packing cubes have earned rave review, thanks to a budget-friendly price, smart size options and water-resistant material. Made of flexible nylon fabric, the cubes can easily store all kinds of clothes and save space. The four-piece set also includes a bonus laundry bag that doubles as a shoe bag. In our analysis of 64 expert reviews, the Shacke Shacke Pak 4-Piece Packing Cubes placed 2nd when we looked at the top 10 products in the category. For the full ranking, see below. For around half the price of the eBags set, you’ll get a 17.5" x 12.75" x 4" cube that’s perfect for pants or larger items like a hoodie, a 13.75" x 12.75" x 4" that’s suited to folded dress shirts, a medium-sized 13.75” x 9.75” x 4” cube that can handle things like t-shirts or swimsuits, and a smallish 11" x 6.75" x 4" cube for undies and socks. Rugged construction (including top-notch zippers), ample space, lightweight design. Available in six bright colors. Included a laundry bag. They are made with high-quality water-resistent nylon material that will withstand the text of travel. The nylon fabric is known for its flexibility hence can easily store the user's clothes in saving space capacity. The nylon material is also water resistant and doesn't hold on to moisture which can lead to aversive odors. Mesh section aren't big enough to allow a good view of contents. The handles could be larger. One of the challenges of a good packing cube is how well it compacts the clothing inside. Some users complained that the bags interior stitching did not hold off after a couple of washes in cold water. One of the toughest things to do while packing for a trip is fitting everything you want to bring with you into your luggage. Our packing cube system fixes that issue by neatly packing all your clothes tightly into our space saving bags. It allows you to easily store and organize your clothing that makes it easy to pack and even easier to unpack. Your clothes will stay more wrinkled free and not get crushed during your travels. We’ve included a laundry bag with your cube set so that you can separate your dirty clothing from your fresh clothes on your journey back home. 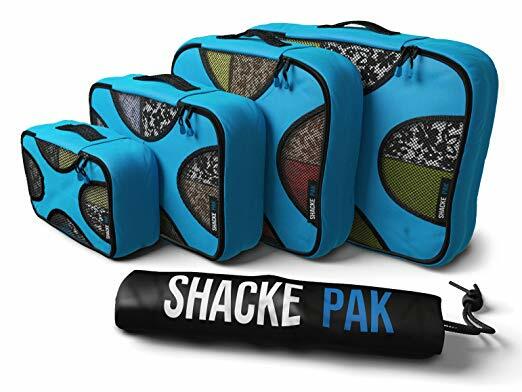 Shacke Pak is made with a high quality durable water resistant nylon material built to withstand the wear and tears of travel. It is reinforced with a X-Design web stitching made specifically to prevent the fabric from folding in the middle, allowing for a more secure packing experience. Our bags are 4 inch deep giving you enough space to pack more clothing. Finally, we've used YKK zippers on all our cubes. YKK zippers are the world’s largest high quality manufacturer of zipper and are known for their smooth sturdy zippers.